When it comes to hockey, flashy goal scorers are often akin to home run hitters in baseball. They create the highlights and generate interest that can carry over to the hobby. While it's still early in his career, Vladimir Tarasenko of the St. Louis Blues is starting to build some of that buzz. The 16th overall pick in the 2010 draft, Tarasenko made his debut during the shortened 2012-13 season. As a result, he's part of the double-rookie class found in 2013-14 products. While there's a mix of low- and high-end options, all of Tarasenko's base set rookie autographs are redemptions. He doesn't appear to be eager to sign them either. While he may eventually come through for both Panini and Upper Deck, it does hurt the overall appeal of them right now. He does have a few insert autographs from 2013-14 that are live, but not many. 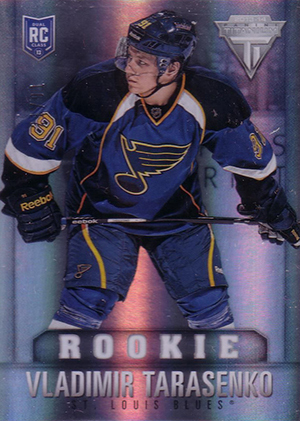 While Vladimir Tarasenko rookie cards came out in 2013-14, he does have some options that pre-date his NHL debut. 2009-10 In the Game Heroes and Prospects Hockey has base cards, autographs and memorabilia cards. They continued to include him in their products for a couple more years after as well. 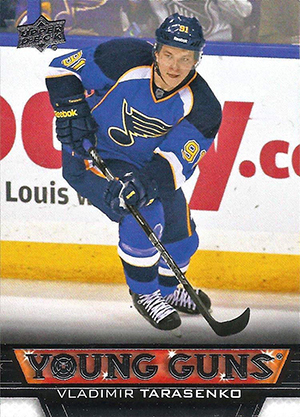 Collectors can also look overseas for Vladimir Tarasenko cards made by Sereal from his time in Russia's KHL. Both Upper Deck and Panini inserted rookie redemptions in select 2012-13 products that were later revealed to feature the flashy sniper. 2012-13 Panini Certified, 2012-13 Panini Limited and 2012-13 Upper Deck Artifacts all have rookie redemptions of Tarasenko. Please note that all high-end autographed Vladimir Tarasenko rookie cards are inserted in packs as redemptions.